#RohitShetty who is excited about his next production #LittleSingham has said that his new show has lot of aspiration value especially for kids. Rohit was interacting with media when he launched animation series "Little Singham", in collaboration with Discovery Kids, Reliance Animation and Rohit Shetty Picturez here on Tuesday in Mumbai. Talking about his ne show ‘Little Singham’, Rohit said, “It is something at a very different level. There is a lot of aspiration value in 'Little Singham', especially for kids. The good thing about animation is that you can put everything in it, all your thoughts. The team has created something which is on different level, in terms of action, and kids will enjoy it. I am waiting for kids to see it and react." About the scale of the animation series, Shetty said: "It is animation, so there are no restrictions. So watch out for full-on action in 'Singham'. This is animation and quite unique. Even as kids when I used to watch animations, it had over the top and larger than life visuals. Rohit has predominantly worked with Ajay Devgn, but currently he is busy shooting for "Simmba", which is an action comic drama featuring Ranveer Singh and Sara Ali Khan. About collaborating with Ajay in future, he said: "There are so many franchises, 'Singham' and 'Golmaal', so we are planning which one to make, so definitely either one of them will be made, 'Singham' or 'Golmaal'. Maybe I will make something else with Ajay Devgn. Everything is in discussion phase right now." In the show, ‘Little Singham’ will deal with new obstacle in every single 11 minute episode. 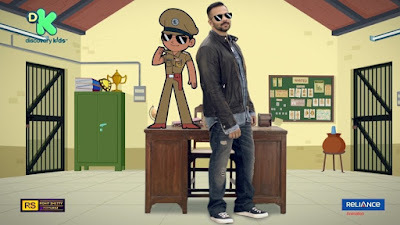 ‘Little Singham’ inspired by the Ajay Devgn hit film series ‘Singham’, is an original kid's content series in India and will be aired in four languages - English, Hindi, Tamil, and Telugu. ‘Little Singham’ will air on Discovery Kids from 21st April, 2018.